It’s Christmas time and there’s nothing quite like a Peppermint Mocha to herald in the season. Unless, of course, you’re in the mood for cookies. 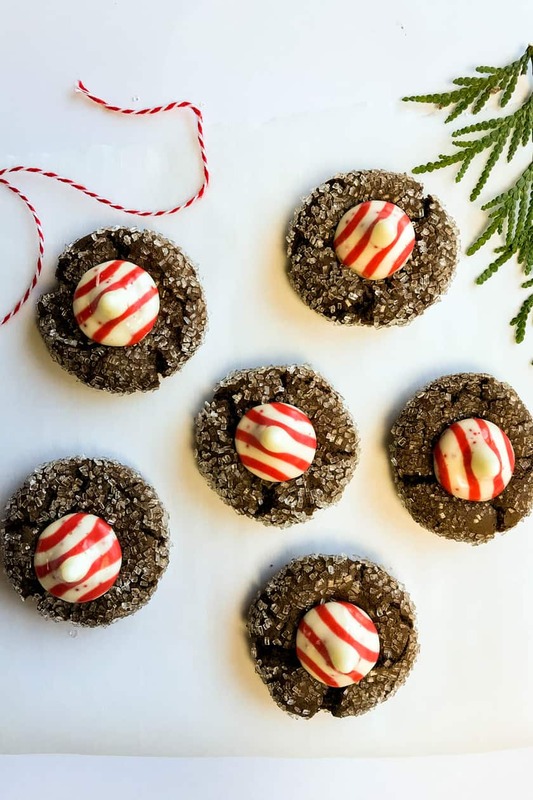 These Peppermint Mocha Chocolate Blossom cookies are like Christmas in every bite. Densely rich with chocolate and espresso, merry and bright with peppermint, and crunchy with sparkling sugar. And, they make darling gifts for the season. One batch will make around 50 cookies. So there’s plenty to share. 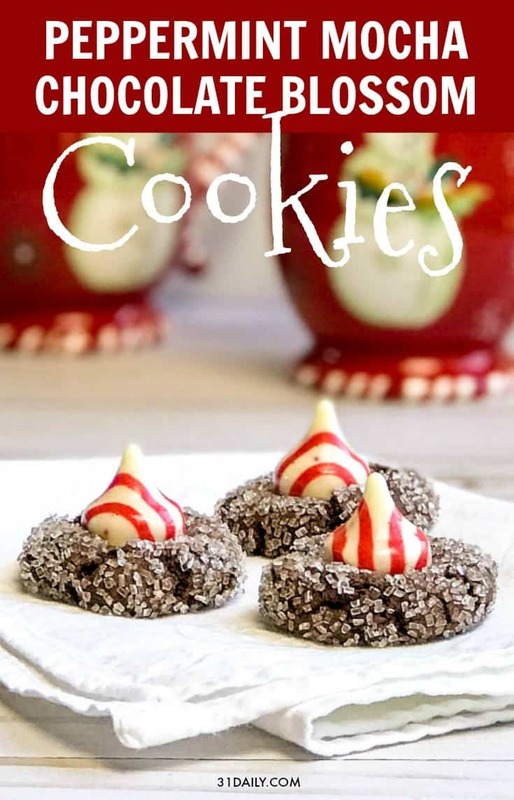 Plus… not only do they taste like Christmas — they look like the holidays too! Cocoa: Be sure to use unsweetened cocoa, your favorite brand. Espresso: One teaspoon of instant espresso is dissolved into one tablespoon of very hot water prior to mixing the ingredients. 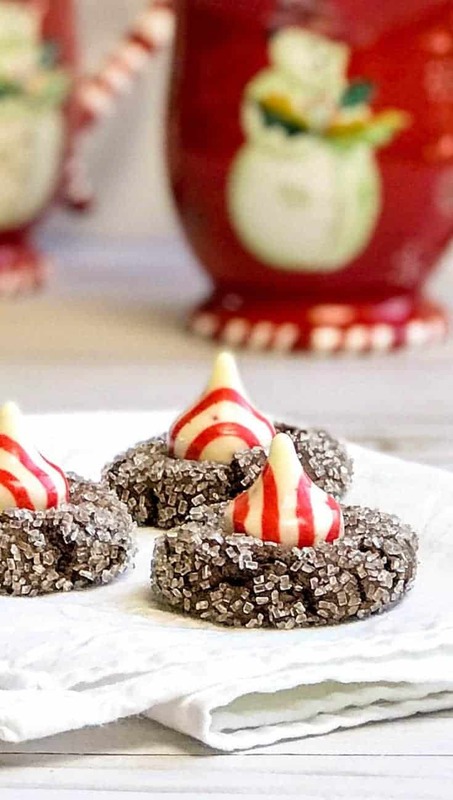 Peppermint: Incredibly important to the flavor of these Peppermint Mocha cookies is the peppermint extract. Don’t skip this ingredient! 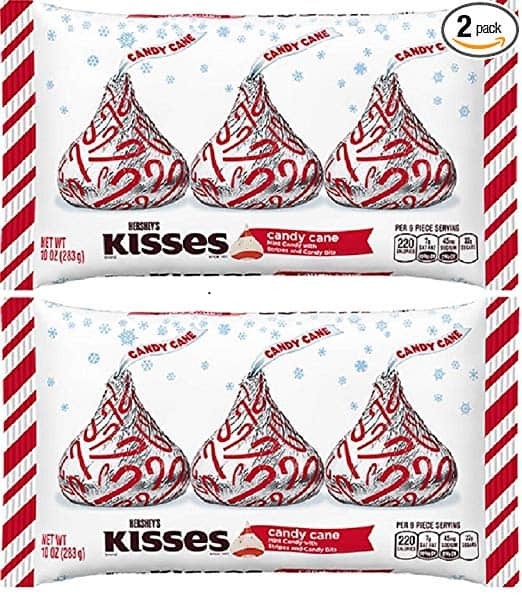 Candy Cane Chocolate Kisses: Pick up a package of Hershey’s Candy Cane Kisses for the striped candy. Sparkling Sugar: Each cookie is rolled in sparkling sugar prior to baking. I love the way the light catches these large sugar crystals. Available in most markets — but here is the brand I have in my pantry. 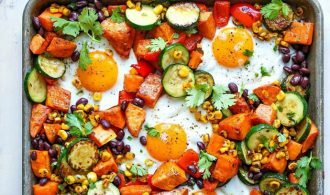 Combine the ingredients into a large bowl and mix until no flour pockets remain. She dough into 1-inch balls or use a 1-inch cookie scoop. 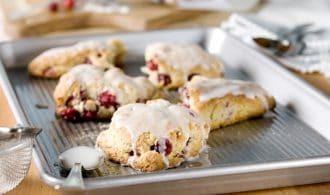 Roll each dough ball in sparkling sugar and place on a parchment-lined baking sheet. Bake the cookies for 7 to 9 minutes, or until set and just beginning to crackle. 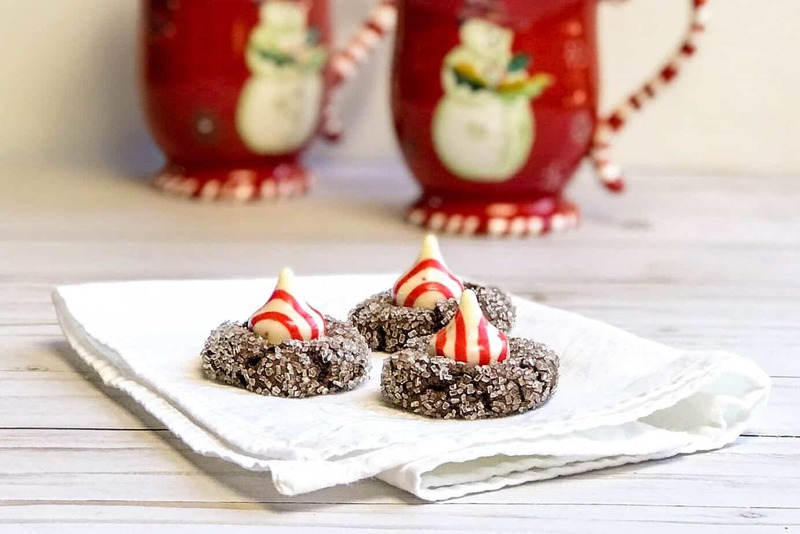 Remove from the oven and gently press a candy cane chocolate kiss into the center of each cookie. 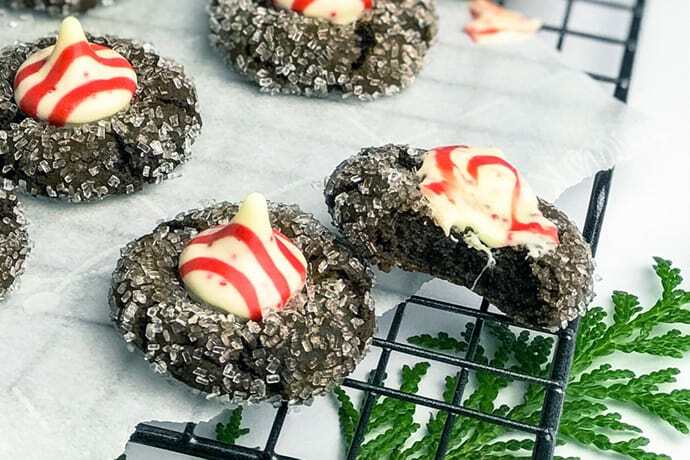 These Peppermint Mocha Chocolate Blossom cookies are a fun addition to Christmas cookie platters — but also make fun and delicious gifts to your Peppermint Mocha loving friends. Simply add a few to a cellophane bag, tie with a festive ribbon. 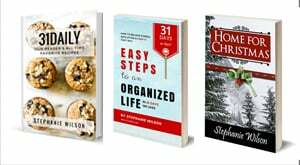 And maybe add some holiday greenery too! In a small bowl, combine 1 tablespoon very hot water with 1 teaspoon of instant espresso. Set aside. Beat butter, sugar, brown sugar, vanilla, and peppermint in a large bowl or stand mixer until well blended. Add eggs, hot water with espresso; beat well. To the bowl add flour, cocoa, baking soda and salt and combine until dough is formed without any flour pockets. Shape the dough into 1-inch balls or use a 1-inch cookie scoop. 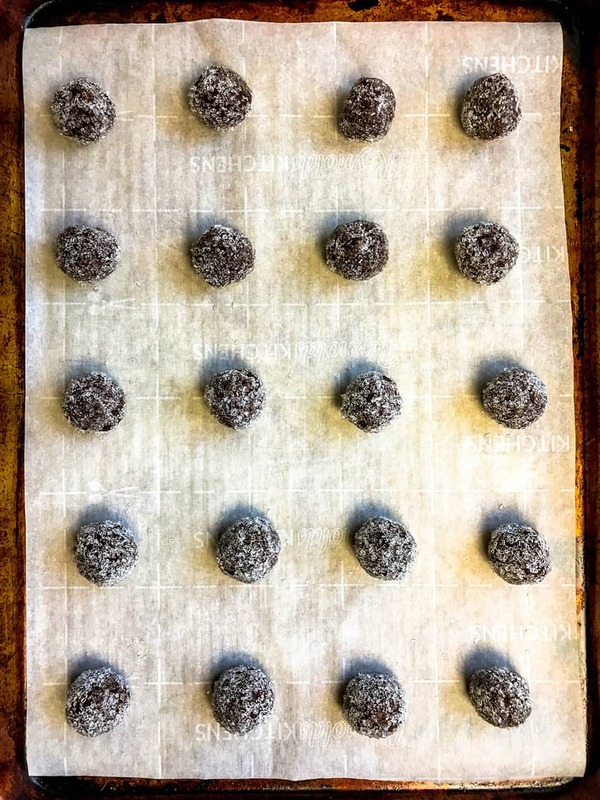 Then roll each ball into sparkling sugar before placing it on the parchment lined baking sheet. If you’re not using parchment paper, do not grease the baking pan. Bake in a 350-degree oven for 7 to 9 minutes or until set and beginning to crackle. In my oven, it’s exactly 8 minutes. Be careful not to overbake these cookies. 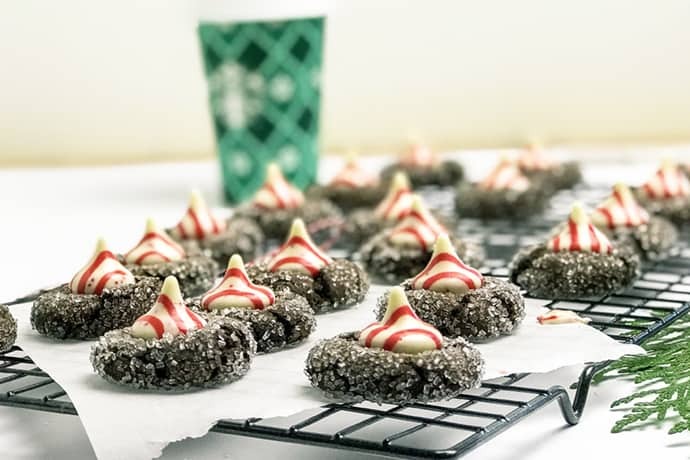 Remove from the oven and gently press candy cane chocolate kisses into the center of each cookie; remove to a wire rack to cool completely. It will make 48 to 52 cookies. I seem to always get 52! If you’re not using Sparkling Sugar, be sure to roll the dough balls in granulated sugar. The texture, though, will be different. A half sheet stainless baking pan. Yes — mine is as old as the hills. Time to buy new :). A cookie scoop — I have both a 1-inch and a 2-inch stainless scoop. Metal cooling rack is an essential cookie baking tool. 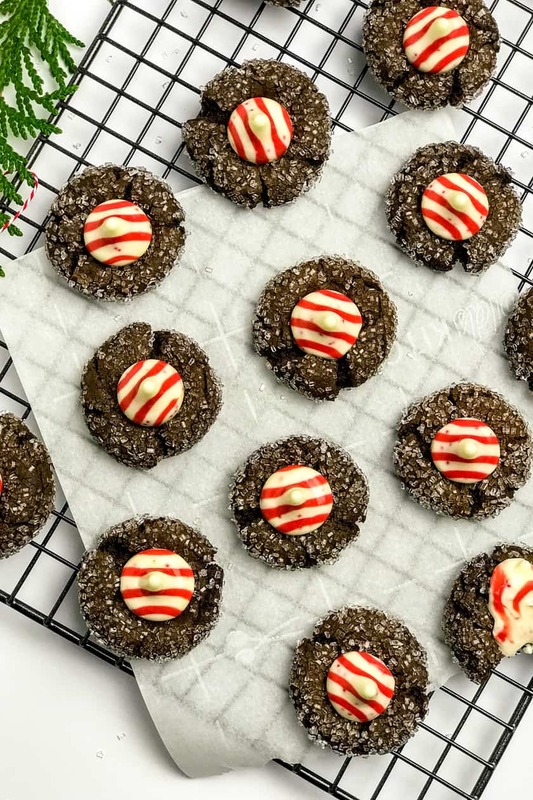 I can’t wait to try the Peppermint Mocha Chocolate Blossom Cookies. They not only sound delicious but they look good too. thank you. Will let you know how they turn out and how they were received! I hope you love them as much as we do, Lois! Can’t wait to hear!! I hope you love them as much as we do, Lois! Can’t wait to hear how they turn out! !